Much to my delight, I received an email the other day from someone who reads my blog via NorwichBulletin.com. Now, I know that there are people who read via the Bulletin as my Stat Counter tells me so (on the few occasions that I bother to check it these days!) but they aren't the commenting type apparently. That's okay, I know that not everyone is and I'm just happy to have people reading. However, to get an email from someone is - to me - really special and I wanted to share that with you as well as the pictures that it inspired. I read your blog in the Norwich Bulletin every day. Thank you for sharing. Mostly, I wanted to write and let you know that your pictures are absolutely awesome! You are an artist with a camera. As a train nut, I love your pictures of the local railroad action. A suggestion if you would like to get some great shots of Norwich from a distance – behind the First Congregational Church in Norwichtown are two paths up to the top of Meeting House Rocks. The view from Avery Chapel is breathtaking. Thank you so much, Patricia, for writing and I'm glad you've been enjoying the my train pursuits! Thank you, also, for your suggestion to visit Avery Chapel. On Friday I decided to do just that being that the weather was rather nice - especially for January! 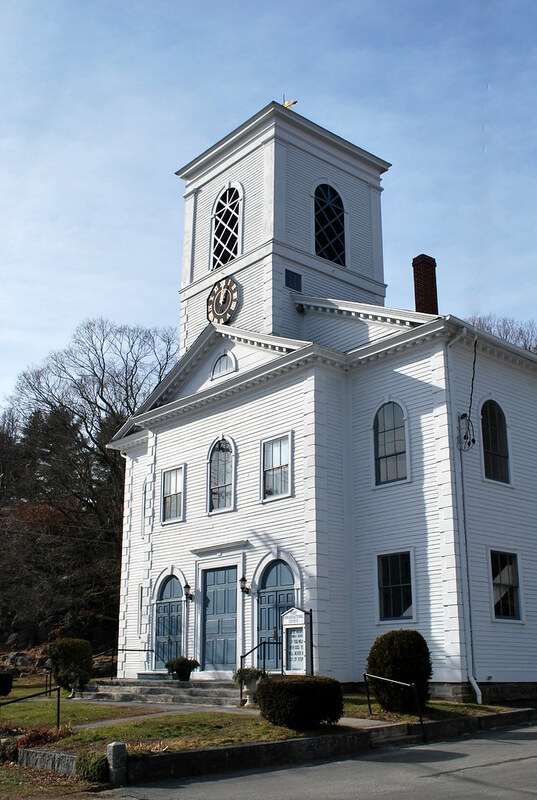 This quintessential New England white clapboard church is actually the fifth meetinghouse for the congregants of the First Congregational Church which was first gathered in 1660. The current building was constructed in 1801 and sits at the western corner of the historic Norwichtown Green. To the left of the church as you are facing it are the Meetinghouse Rocks - the site of the second and third meetinghouses for the congregation. I really wish that I was able to find a picture somewhere of those buildings as I just can't even begin to fathom what they looked like standing atop the rocks. 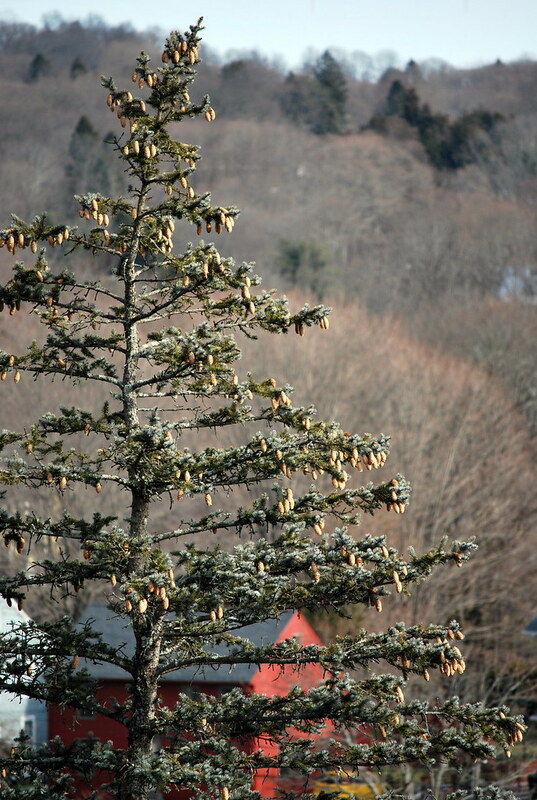 I can understand why the congregants built them up there, though, it's very pretty on the summit as you'll soon see. 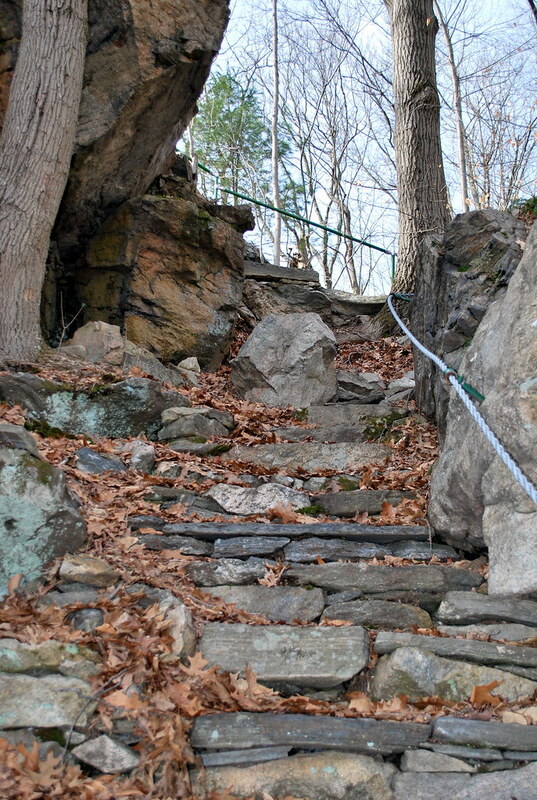 One of the two paths that Patricia referred to in her email begins at the base of Meetinghouse Rocks and leads up a rather steep set of stone stairs to the summit. This is actually the path that I took down from the summit as I opted to climb the second path, located behind the church, up as it didn't require the skills of a mountain goat! Truth be told, this particular path may have been easier going up than it was going down but I had my Dad's trusty walking stick with me and took my time as I really didn't want to end up in a pile at the bottom of the path with my camera in pieces! Both paths have boxes with Visitor Information and brochures that explain the history of The Albert Curtis Avery Memorial Chapel that now stands at the summit and it was nice to know that visitors were welcome as I'm always a little afraid that I might be inadvertently trespassing somewhere when I'm out looking for pictures. The brochure that I picked up welcomed me to Avery Chapel and just asked that I remembered that I was walking on sacred ground. The Avery Chapel was built as a gift to the church so that its namesake would always be remembered. Albert Avery was an advisor to the Senior Pilgrim Youth Fellowship of the First Congregational Church who died unexpectedly at the age of only 32 the same year I was born - 1958. 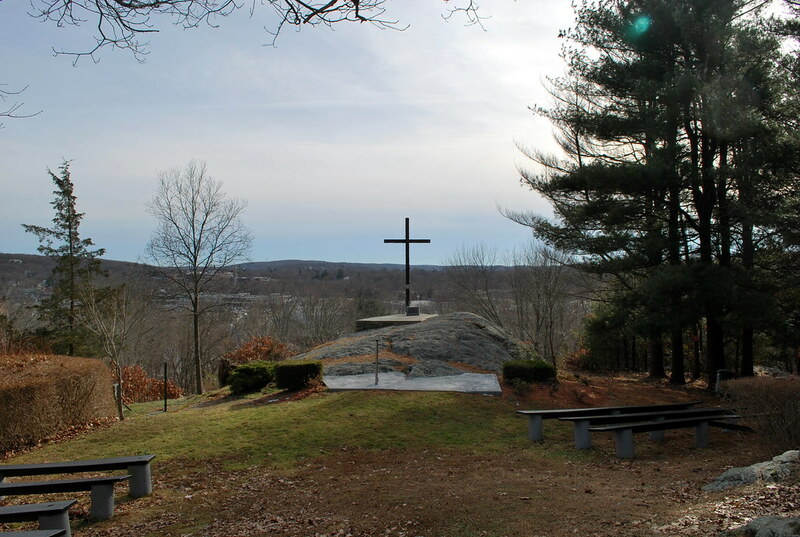 Inspired by the significance and beauty of the Cathedral of the Pines in New Hampshire, a place the Senior Pilgrim Youth Fellowship traveled to every year, it was decided to build a chapel patterned after the Cathedral as a remembrance to Albert. With many people donating not just money but their time and talents to the project, it became both a church and community effort which was completed in time for its very first service to be held on March the 29th, 1959 - Easter Sunday. Over 200 people made the climb to the summit to attend the service. 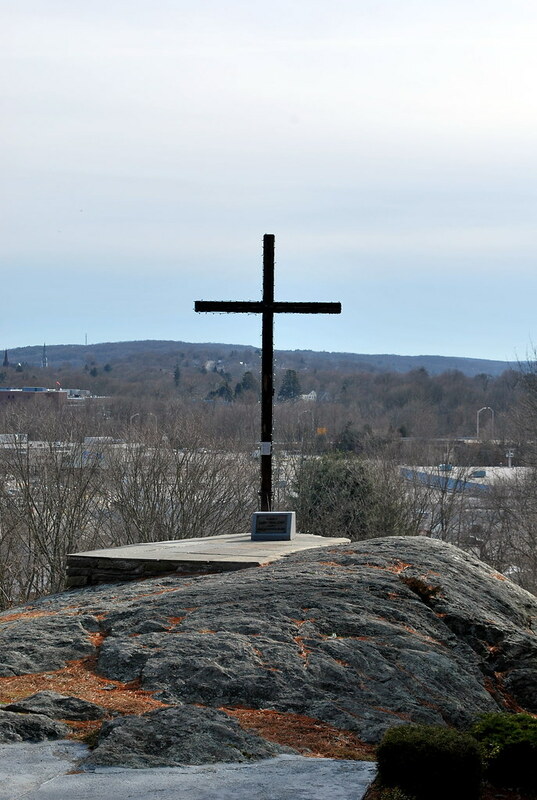 Over the past 50 years, the cross has been replaced, benches have been added, and flowers and bushes have been planted in memory of other loved ones. 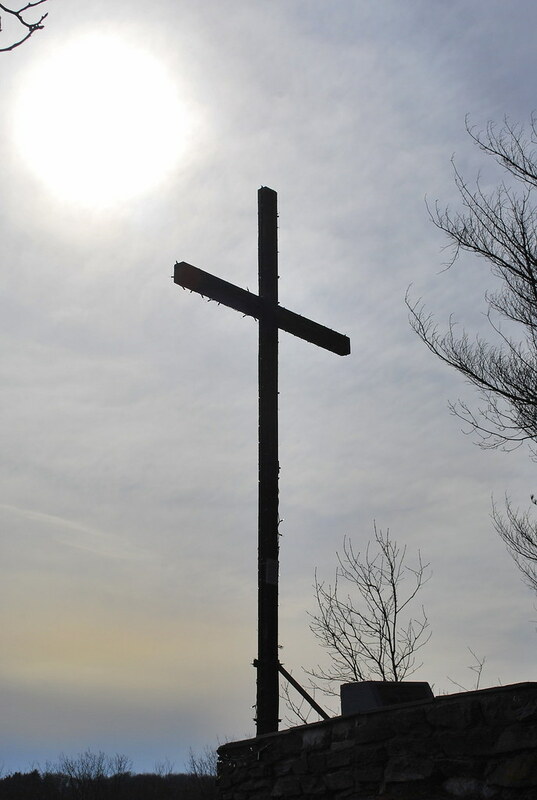 Services are still held at Avery Chapel for various occasions including an Easter Sunrise Service that must have the most spectacular view in all of Norwich. 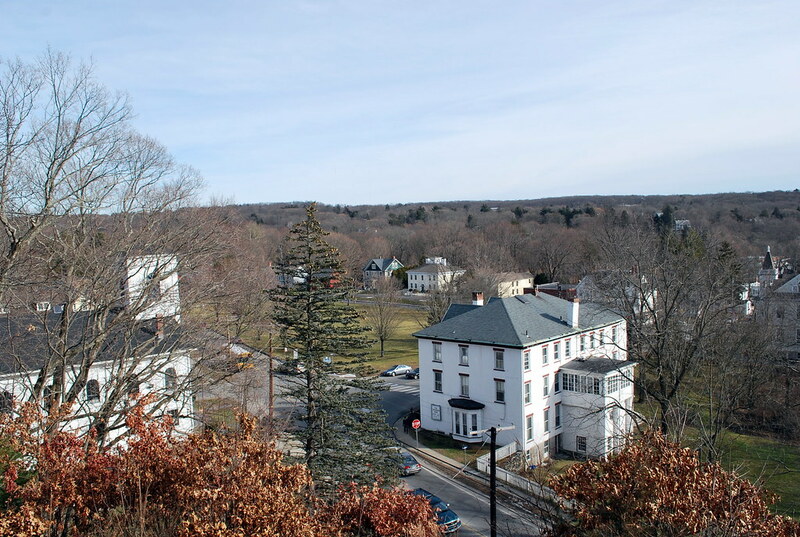 From the summit one can get a gorgeous view of the Norwichtown Green and some of the historic homes that surround it as well as the Johnson Home for Ladies (the large white building) that sits on the corner of Town Street and West Town Streets. I've often driven by and thought it might not be a bad place to spend one's advancing years as one becomes history while overlooking history. 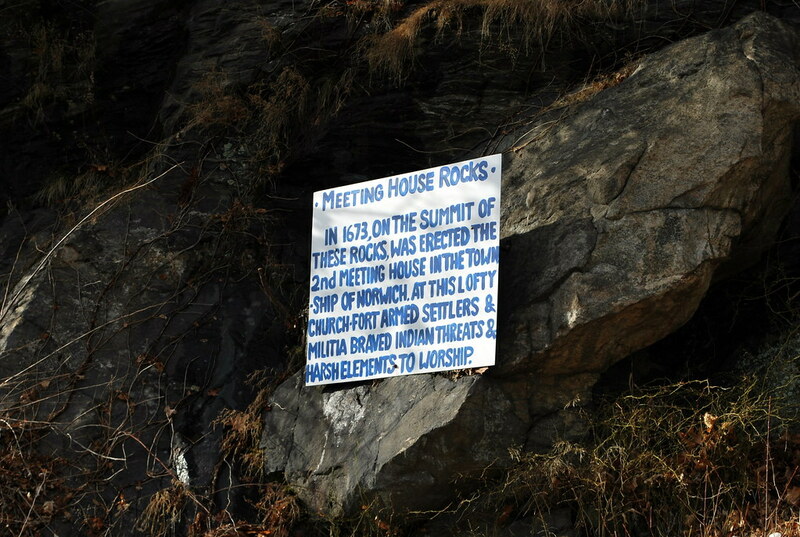 I've driven past Meetinghouse Rocks and the First Congregational Church more times than I can count and had often wondered about the summit but was never quite sure how one got up there. 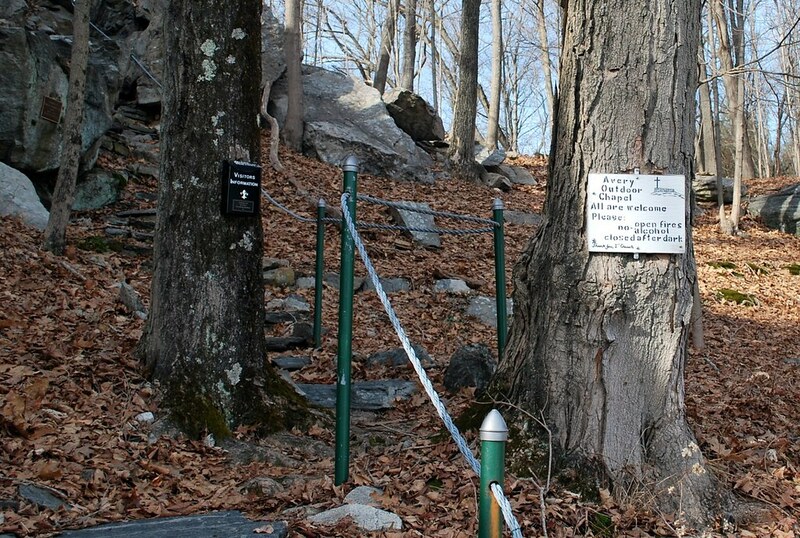 Thank you again, Patricia, for telling me about those two paths and giving me the inspiration to climb to the summit. It's beautiful up there and I can guarantee you that it won't be my last visit; I've already made a note to myself to go back during sunset sometime soon and if I can ever roust myself out of bed early enough in the morning, I'm sure the sunrises from there are well worth the early hour. Beautiful photos. So glad you took the advice of a reader. I hope to read that you have a book of your photographs being published soon. Makes you wonder what kind of stories could be told by some of the congregants...living history. Love it. I love your local history posts, Duchess Linda of Norwich Upon Thames. Your photos are spectacular, as always. The Johnson Home for Ladies??? I'm thinking I should try some more steeple chasing. Great shots!The view up there is wonderful... Your reader was correct. WOWZA! Simply breathtaking. Bless you, Patricia, for suggesting this to Linda. I know you'll be back often and show us the proof. gorgeous as always. i can see that being a spectacular spot to visit in the autumn!!! Great job! One thing I miss about living up North is the scenery. Absolutely love the pictures Lindy Loo! 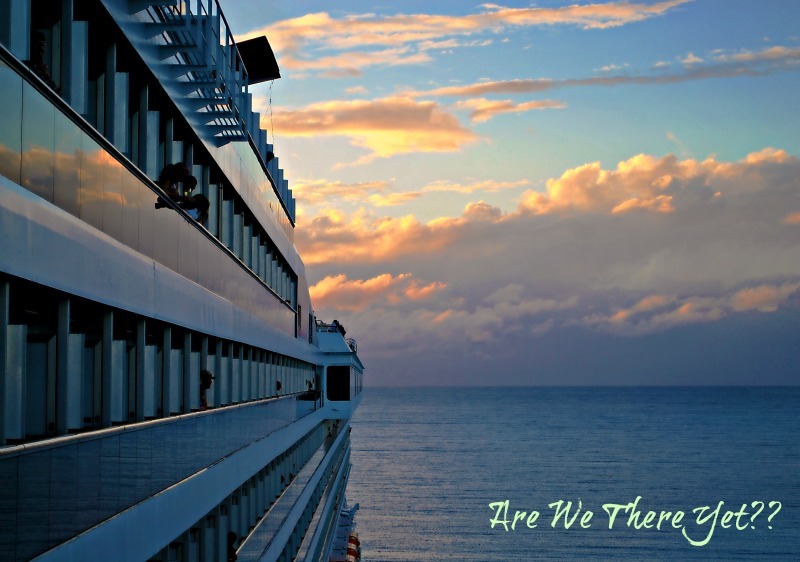 I love the fact that a reader inspired this post and I hope others chime in with suggestions, that would be a great feature for the bulletin and this blog. Excellent post on history of the location as well as some great photographs. I tried scrounging for some pictures of the old church with no luck though I did find others equally gone on Ancestry. The local historical society might have something in their collection. Ah ha! Now that you have a "non-blogger" as it were, telling you how good your photographs really are, maybe you'll believe us, the bloggers who follow your posts and the pictures you present to us when we tell you that too! You really should try to find a good outlet for your photographs -one that might even bring you some cash in return too! Good job Linda -on all counts! I agree with the writer of that letter...you are an artist with your camera. I suspect that one day we'll be able to purchase a coffee table book full of your outstanding photography. I've never been up there. Thank you for posting how to get up there. I'll try it, but will wait till summer ;) That view will be totally worth it. Oh, Linda! It's beautiful. I am so glad she wrote you also. :) What an awesome place this must be to visit.